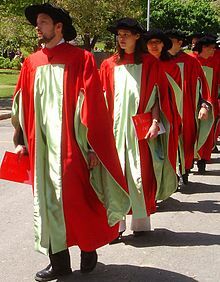 Ph.D. candidates march at Commencement in McGill's scarlet regalia. ^ Doug Lennox (31 August 2009). Now You Know Big Book of Sports. Dundurn Press Ltd.. pp. 12–. ISBN 978-1-55488-454-4. https://books.google.com/books?id=vnj4TSwDvacC&pg=PA12 2011年6月10日閲覧。. ^ An Introduction to the Arboretum Archived September 23, 2007, at the Wayback Machine. ^ This Land Was Made for You and Me... McGill University Health Centre Journal, July/August 2001 Archived August 29, 2005, at the Wayback Machine. ^ McCabe, Daniel. MUHC site chosen, McGill Reporter, November 5, 1998. ^ Research and education, McGill University. Accessed May 3, 2008. ^ "Mcgill University", "Learnist.org Study Abroad", 2008. Accessed May 16, 2008. Archived January 23, 2010, at the Wayback Machine. ^ "McGill University Teaching Hospital Network" - "McGill University Faculty of Medicine" Archived May 6, 2008, at the Wayback Machine. ^ Countries and International Organizations Granted Exemptions from the Additional Financial Contribution by the Government of Quebec, Ministère de l'Éducation, du Loisir et du Sport. Archived July 21, 2006, at the Wayback Machine. ^ "Entrance awards", McGill University. Retrieved June 13, 2008. Archived April 16, 2008, at the Wayback Machine. ^ "Renewals", McGill University. Accessed May 4, 2008. Archived April 29, 2008, at the Wayback Machine. ^ "Schulich Leader Scholarships reward excellence, service", McGill University. Retrieved June 30, 2014. ^ Students | About McGill - McGill University. McGill.ca. Retrieved on 2013-12-23. ^ "McGill français and Quebec society", "McGill Reporter", April 8, 1999. Accessed May 16, 2008. ^ "About the Museum", "McGill University". Accessed May 11, 2008. ^ Where we are, SSMU The William Shatner University Centre is located at 3480 McTavish Street, on the west side of the McGill campus Archived April 10, 2008, at the Wayback Machine. ^ Stojsic, Leslie. "The trek back home". McGill Reporter, March 11, 1999. ^ "About The McGill Daily" Archived 2009年1月15日, at the Wayback Machine., "The McGill Daily", 2008. Retrieved June 13, 2008. ^ Student newspapers adapt to drop in advertising – - Maclean's On Campus. Oncampus.macleans.ca (2013-08-01). Retrieved on 2013-12-23. Archived September 21, 2013, at the Wayback Machine. ^ , "The Bull & Bear", 2013. Retrieved May 18, 2013. ^ "Greek Row: Fraternity participation up, sororities down" Archived 2008年3月19日, at the Wayback Machine. The Daily Utah Chronicle, November 7, 2007. Accessed May 3, 2008. ^ Chester, Bronwyn. "Queerly cause for celebration", "McGill Reporter" March 21, 2002. Accessed May 5, 2008. ^ "Our Mandate", Queer McGill. Accessed May 5, 2008. Archived July 28, 2007, at the Wayback Machine. ^ "Quick Facts", "McGill Athletics", 2011. Accessed May 24, 2012. Archived January 20, 2011, at the Wayback Machine. ^ Sharma, Mira. "CAMPUS: Marty the Martlet turns one"[リンク切れ], "The McGill Tribune" September 26, 2006. Accessed May 5, 2008. ^ "Facilities", "McGill Athletics", 2003. Accessed May 16, 2008. Archived May 12, 2008, at the Wayback Machine. ^ "Welcome to Macdonald Campus Athletics", "Macdonald Campus Athletics", 2008. Accessed May 16, 2008. Archived May 12, 2008, at the Wayback Machine. ^ "Molson Stadium", "McGill Athletics", 2008. Accessed May 17, 2008. Archived April 27, 2008, at the Wayback Machine. ^ A History of Canadian University Football, Robert E. Watkins Archived April 12, 2008, at the Wayback Machine. ^ Watkins, Robert E."A History of Canadian University Football", "CISfootball.org", May 2006. Accessed May 18, 2008. ^ "History of American Football", "NEWSdial.com", 2008. Accessed May 18, 2008. ^ "McGill Redmen GAME NOTES for Ottawa & Clarkson – UPCOMING MILESTONE"[リンク切れ], "McGill Athletics" January 5, 2007. Accessed May 4, 2008. ^ Athletics, Viewbook 2005–2006. Archived August 22, 2006, at the Wayback Machine. ^ "McGill's Olympians", "McGill Reporter", September 7, 2000. Accessed May 16, 2008. ^ "McGill send 27 to 2004 Athens Summer Olympics" Archived 2005年12月18日, at the Wayback Machine., "McGill Athletics", August 13, 2004. Accessed May 16, 2008. ^ "2004 inductees to McGill Sports Hall of Fame"[リンク切れ], "McGill Athletics", June 24, 2004. Accessed May 16, 2008. ^ “U of T Soccer to Host Old Four Tournament”. 2008年9月2日閲覧。 [リンク切れ] "The University of Toronto Varsity Blues soccer program is proud to host a very time-honoured tradition - the annual Old Four tournament, August 30–31, 2008 at the Varsity Centre. 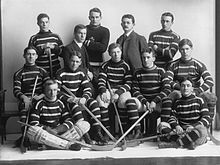 This tournament features the original four football schools in Canadian university sport: McGill University, Queen’s University, the University of Western Ontario and the University of Toronto."